From left to right: Abdul Karim Bin Abdul Munaf, Rohayati Binti Rofiq and Abdul Ghani Bin Abdul Munaf. "The school (was) a little big and I was really nervous," he said. "Like I'm a first time. Nobody know me, who I am and where I come from." Growing up in Malaysia, Ghani said he couldn't go to school or work because of discrimination against Muslims. Two of his older brothers had been resettled in Greeley. So, in December 2017, Ghani, along with his mother, sister, three other brothers and a niece joined them. "My mom said, 'I got opportunities to take you all, go to the America,'" Ghani said. "'(They're going to) give you opportunities to go to the school and learn something, be something.'" Ghani sits in a class at Greeley Central High School. He was one of about 370 English language learners in the 2017-2018 school year. "The most important thing that I have to do is learn English to speak," he said. "Because if I don't know how to speak English, it's going be tough for me wherever I go." Laura De Groote discusses an assignment with Abdul Karim Bin Abdul Munaf during Algebra 1 class at Greeley Central High School. Laura De Groote, a CLD who co-teaches math, said this format helps students who have different academic backgrounds and are learning English to access grade-level content. "Some students have had a strong academic background from their native country," De Groote said. "Others, they were not able to do all years of school prior to coming to high school." Two decades ago, De Groote said, there were probably 20 EL learners at Greeley Central. Last school year, they made up almost a quarter of the student body. "Predominately my students, when I first started here, were Spanish speakers, mostly from Mexico," De Groote said. 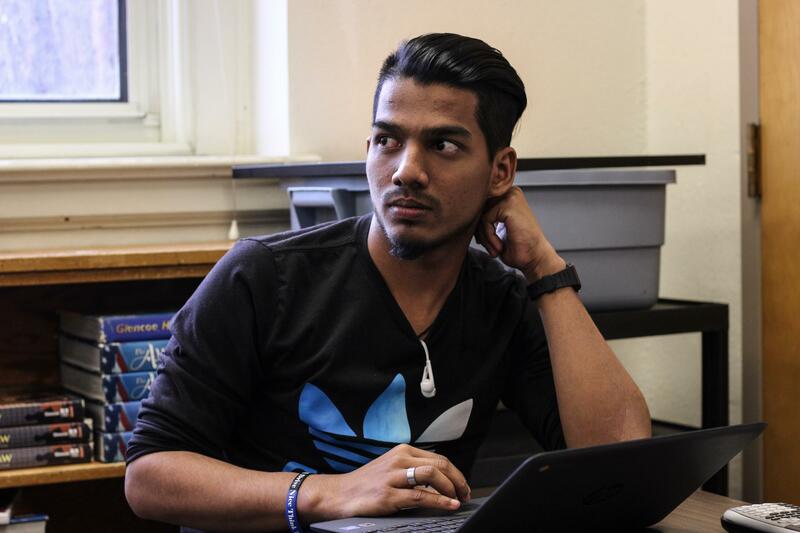 "The past decade, the population has diversified greatly with incoming refugees from different countries and then a lot of students from Central America." Rohayati Binti Rofiq is Ghani's niece that moved with him to Greeley. "When I get here, I can't believe it," Rohayati said. "I was so happy and I can go (to) school." In Malaysia, Rohayati stayed at home. She did the cooking and helped her grandmother and mother with her younger siblings. But here in Greeley, she's just another teenage girl hanging out with her friends between classes. Rohayati Binti Rofiq enjoys going to school and hanging out with her friends between classes. "My friends the best," she said. "They help me, they help me with my homework and we make some fun and go outside." Many of Rohayati's girlfriends are also Muslim and they wear hijabs, or headscarves. Rohayati, on the other hand, wears a niqab, or face veil. 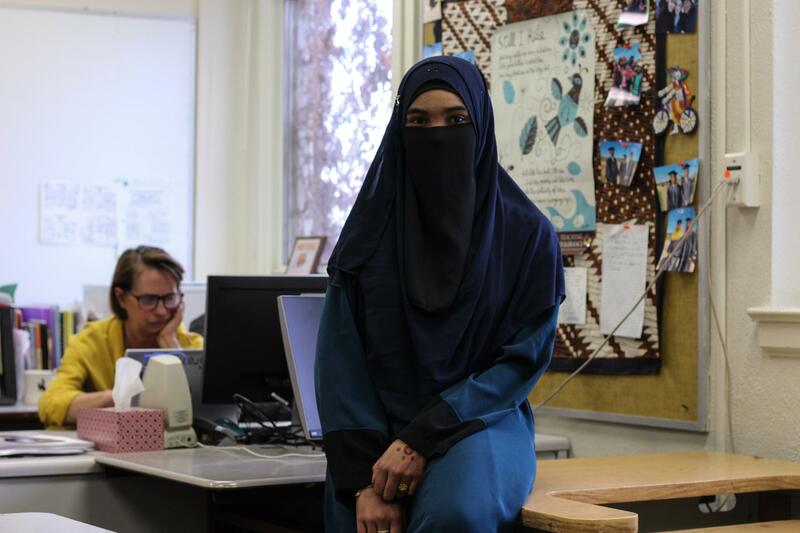 "I tell her like, 'you are very brave,'" said Fathia Barkadle, a CLD teacher who co-teaches social studies. "Not a lot of people would do that and I'm very proud of her." Somali Fathia Barkadle grew up in Ethiopia before resettling in the U.S. at 14. She became a teacher at Greeley Central High School to work with immigrant and refugee students. Barkadle is a Somali Muslim. But she grew up in Ethiopia before resettling in Minnesota with her family when she was 14. "Whenever I see them, I just see new me," she said. "I was an English learner, I was (a) refugee student. I was an immigrant student. I was the newbie of the school." Now 27 years old, Barkadle is a graduate of the University of Northern Colorado. She majored in psychology and English as a second language. Barkadle became a teacher to work with newcomers. "I see a lot of diversity in our schools among students specifically, but I don't see a lot of diversity among staff," she said. "I want to show our students that, 'Hey, there is one of you in staff and you can aim like that or higher, or become a scientist or someone.'" Abdul Karim Bin Abdul Munaf, who goes by Karim, has Algebra 1 first period. He's Ghani's older brother and also Rohayati's uncle. "In my entire family, no one graduate from school or college," Karim said. "So, I'll be the first one." 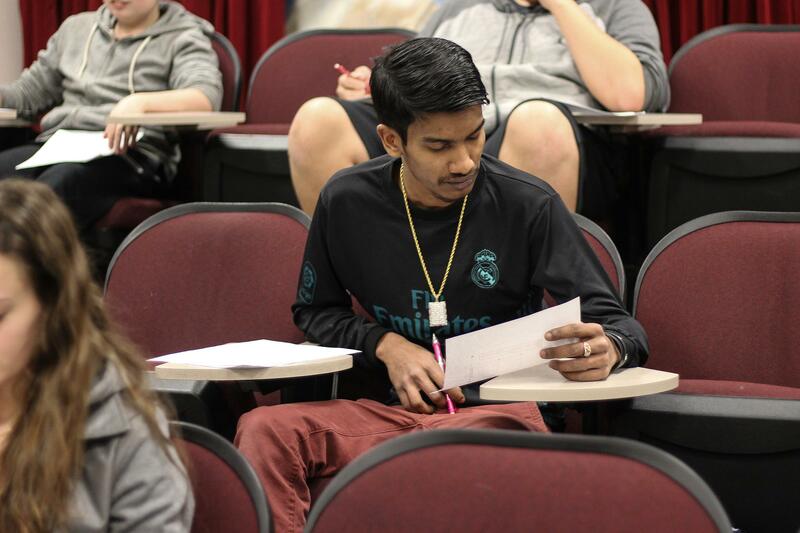 Karim was 19 years old when he enrolled at Greeley Central last January. He must finish all his credits before Jan. 1, 2020, when he turns 21 and ages out of high school. CLD teacher Laure De Groote has taught Karim from the beginning and said he came to school with some academic deficits. Karim, 20, plans to graduate high school by the end of 2019 and study information technology in college. "He didn't have some things like basic skills that we learn in primary (education), like multiplication, division. But he picked up those quickly and he's tackling grade-level work now," De Groote said. Karim graduated from Islamic school in Malaysia, but he studied religion there, not academics. Now he stays after school, gets tutoring and takes online classes to complete high school in two years. "I have to do it before December. I'm looking forward to do it," Karim said. "I want to graduate so badly because just want to make my family's life better and make them proud of me." Last spring, Karim won an academic award for excellence in Foundations in Language Arts. He said he plans to go to college and study information technology. As for Rohayati and Ghani, they're simply enjoying life as high school students. "I can go to school, have friends," Rohayati said. "I love that." "Make a life. That's all," Ghani said. The Trump administration has cut the number of refugees allowed to settle in the U.S., citing security concerns and a desire that they remain closer to their home countries. Last year, 981 found homes in Colorado — far fewer than in years past. The change has created a degree of sadness among those hoping to bring their families here, said Kit Taintor, Colorado's refugee resettlement coordinator. "There's a lot of refugees who live and reside in Colorado, and call it home, who have been waiting for the opportunity to rejoin with family members who are still overseas," said Taintor. This week, KUNC is sharing stories from our state's refugee community. With Fewer Refugees, Who Will Work At Greeley's Meatpacking Plant? In 2007, when he came to the United States, Hade started out like many refugees in the area by working at local meatpacking plants. The jobs are easy to pick up, don't require English skills and pay better than other similarly skilled employment. Hade worked at both JBS in Greeley and Cargill in Fort Morgan. But he had dreams of doing something different. The inside of Enas Alsharea's office is small, but tidy. There's a coffee mug on her desk with a photo of her smiling kids on it. "This is my daughter, Abby," she said, showing off her space. "She's 11 and in the fifth grade. This is my son Haydar. He's in first." She likes her job, but it's a far cry from her time as a practicing dentist in Baghdad, Iraq.